Stayed Jun 13 We had a group of 18, everyone had a great time, good service, good food, good facility. We had good experience of yoga, Thai boxing, cooking class, massage and of course most enjoyable large pool. A magnificent 7 bedroom grand residence occupying a hidden headland on Koh Samui's unspoilt northern shore, offering unrivalled tropical luxury and stunning views from its forested cliffside location and a short and easy walk through its gently sloping flowering gardens down to a secluded private cove and sandy beach. Built and finished to the highest international standards, this stunning home offers total privacy and undisturbed exclusivity in a series of elegant stand-alone pavilions set amid beautifully landscaped and shady grounds, home to towering palms, banyan and tamarind trees. Polished teakwood floors, vaulted ceilings and plentiful windows create a bright and airy indoor setting, and outside, the impressive array of onsite facilities, including a private Clubhouse, private 10-seater cinema, heath and fitness suite, tennis court and majestic ocean view infinity pool, combined with its guaranteed 5-star service and cuisine, make this the absolute best in high-end personalised beachside living. The villa's 7 bedrooms (plus a dedicated children's room) are all individually furnished to provide complete comfort within this inspiring and exotic location. The en suite bathrooms are generous, and each room has a unique selection of handpicked Asian and tribal artifacts, contemporary artwork and soft furnishings. The semi-private beach is flanked by rocks and is therefore very secluded. The views over the bay to neighbouring Koh Phangan are breathtaking: the dramatic skies and crimson sunsets offering a wonderful natural spectacle. Please note that the low tidal phenomenon means that at times some rocks will be uncovered. The small cove fronting the villa also has its own protected rock pool (not accessible during seasonal high or low tides). The residence is fully staffed by an efficient team, including an experienced, multi-lingual Property Manager. First-rate hospitality, an incredible range of comforts, fabulous facilities and a dramatic oceanfront location make Villa Riva one of Koh Samui's most extravagant and engaging private luxury residences. This exquisite, expansive and unique residence is also the perfect venue for weddings, celebrations and corporate events as it features a specially designed, covered events platform with a marriage gazebo, water feature and a purpose-built food and beverage service area, DJ podium, dedicated bar and guest bathrooms. The Master Villa consists of a lounge area, 1 grand master suite, 2 spacious guest suites and 1 teenagers' / nanny's room. All the suites are elegantly spacious and decorated with striking contemporary Asian art and collectables. The two suites on the first floor both offer generous bedroom and living spaces, and indulgent bathrooms with large tubs. One of these suites and its en suite bathroom have been designed for guests with reduced mobility enabling wheel chair access. The grand master suite, on the upper level of the pavilion, features in- and outdoor showers, the latter with dramatic ocean views and stunning evening sunsets. The bathroom centrepiece is a large whirlpool Jacuzzi. The suite enjoys a spacious terrace with sun beds and a 4-seater sofa overlooking the villa's pool and main sun deck. A separate fourth bedroom with twin beds and an en suite shower room is suitable for teenagers or a nanny. Villa A has 2 guest suites which are both comfortably furnished and have floor-to-ceiling wood and glass doors that slide open onto shaded, glass walled balconies. The upper level suite has a four-poster bed and a sofa and overlooks the cove. Its en suite bathroom has shuttered windows and a large built-in tub and shower. The lower level suite offers a king size bed and opens to the deck and the tamarind tree, which provides provident shade to a section of the beach. The en suite bathroom features a rain shower. Villa B combines a luxuriously appointed suite - with the mattress raised on a platform - and a specially designed and decorated room for 2 children, creating a real family haven. The en-suite bathroom has a large bathtub with a hand shower. An outdoor covered deck beneath the bedroom overlooks the beach and Koh Phangan: a beautifully peaceful place for quality time with the family, quiet reading, or simply relaxing while looking out to sea. Main Level - A stone entrance opens to a vaulted lounge and dining area where wood and glass doors open onto the large pool deck. The spacious dining room has a round 16-seater solid teak table, served by a fully fitted western kitchen. A separate kitchen allows staff to unobtrusively prepare meals for guests. Upper Mezzanine Level - The expansive main lounge area is furnished with a giant, 9-metre sofa, plus a pool table and a gaming table and an extended choice of books for holiday reading. Mid-Lower Level - A few steps down from the main floor is the dedicated health and fitness area, which includes a gym with the latest exercise machines. The lower level offers the sea-view pool deck, a dry sauna, steam room, large Jacuzzi and a massage room for private spa treatments. A large changing area and shower compliment the resort-style facilities. Lower Level - The villa's unique, 10-seater, fully automated cinema and video games room is perfect for evening entertainment. Movies and lighting are controlled from a programmed iPad and the room has its own mini bar and microwave. A fitted wine cellar occupies an adjacent room, where the wine cooler is stocked with over 100 bottles, covering the finest vintages and champagnes from around the world. This floor also features the changing and shower facilities for the tennis court. Pool & Sun Terrace - The Clubhouse opens onto a wide wooden multi-level furnished sun deck. The 32-metre infinity pool on the main deck has a built-in 8-person Jacuzzi, and is surrounded by sun loungers, while the lower deck accommodates several sofas from which to enjoy the fabulous sea views. One side of the deck has a roofed poolside relaxation sala, while a second furnished sala is an ideal location for a BBQ and al fresco meals and drinks, prepared by the villa's private chef. Guests can expect all the facilities and services of a luxury resort at this superb villa, but with the added advantage of absolute exclusivity and privacy. Almost every conceivable vacation indulgence is readily available, either within the villa and its grounds or through the concierge service, so the opportunities are limitless. All bedrooms are non-smoking, and have air conditioning, a king size bed, bathrobe, en suite bathroom, hair dryer, mini bar, personal safe, TV with satellite & DVD, telephone interconnecting with other rooms and the Property Manager, and a writing desk. Exceptions: Bedroom 4 on the ground floor of the Master Villa has twin beds and a smaller en suite bathroom with shower only. This room is ideal for teenagers or a nanny. The dining room has air conditioning, a highchair for children, and seating for 16 guests. The living room has air conditioning, large folding door opening onto the pool deck, lounge areas on ground and upper floor. In-Villa Staff - The villa is fully staffed by Thai and international hospitality professionals, who live on site, ensuring total dedication and attention to guests' needs at all times. 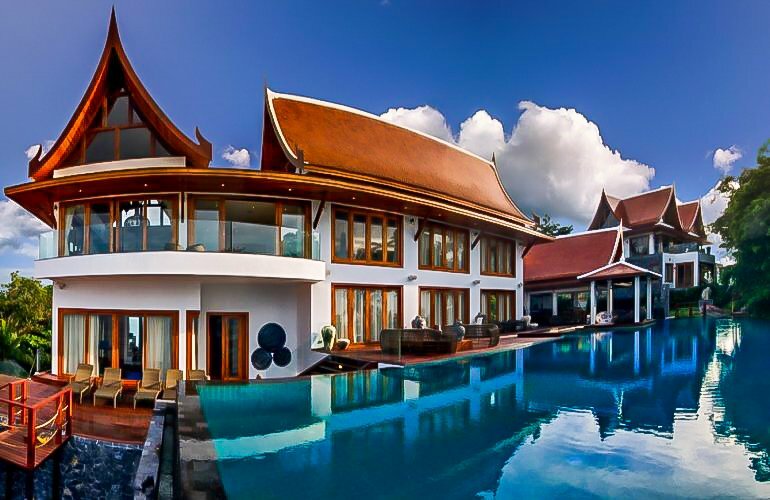 A Thai chef will prepare a range of Thai and international dishes from the in-villa menu, plus high tea selections. There is a cocktail menu and a choice of fine wines from the cellar. Guests can also request special meals, such as a BBQ or celebration dinner prepared to order.